Yuri’s Night, the worldwide space party celebrated each April 12 since 2001, not only recognizes Yuri Gagarin, the first human in space, but also the Apollo astronauts as we approach the 50th anniversary of the first crewed moon landing of Apollo 11. This year, thousands of people will be celebrating the accomplishments of the brave men and women who have and currently are venturing into space to perform research and push the boundaries of human capabilities. Walnut, CA, April 11, 2019 --(PR.com)-- Many would say that the 1960s were the golden age of human spaceflight. There were massive achievements by the Soviets and the Americans that helped the world superpowers to send the first manned space ships into orbit and eventually to the moon. The technology to accomplish these historic missions spawned the miniaturization of technology that we now know as the information age. Then some information age titans, raised on shows like Star Trek and who saw the Apollo 11 moon landing first-hand as children, decided that space should not just be owned by world powers, but that anyone should be able to jump on a rocket to get a global perspective on the blue marble humanity calls home. This has spawned a new golden age of spaceflight where companies like SpaceX and Blue Origin raise the bar for competitively-priced space ships. Innovations in satellite design and miniaturization may soon allow all humans to access low-cost internet from orbit, no matter whether they live in Hong Kong or the Namib Desert. Yuri’s Night is an event that was created in the year 2000 as a fun way to raise awareness of human spaceflight among the majority of global citizens who don’t work for companies that launch rockets and satellites on a daily basis. 2019 is set to be an amazing year for spaceflight around the world. SpaceX plans to launch a crew on their Dragon capsule this year, and Blue Origin hopes to have their first suborbital crewed launch. Even the steady hands at the world’s space agencies are showing that they can improve on the monthly process of delivering crew and supplies to the International Space Station, delivering the latest Russian Progress craft from the ground to the station in a mere 3 hours and 23 minutes (2 orbits) - a new record. The launch of a satellite like Sputnik or Explorer 1 that took the work of thousands of engineers across a nation in the 1950s can now be accomplished by a startup in a garage that can hitch a ride on a rocket with a larger payload. To celebrate this amazing future for human space exploration and commemorate our past accomplishments, Yuri’s Night 2019 is being celebrated by thousands of people this year at over 160 events in over 40 countries around the world. The first events kicked off on April 5, though most events will happen near the anniversary of the first human spaceflight of Yuri Gagarin on April 12 this year. Events are being held around the world in a huge variety of locations from Dar es Salaam, Tanzania to Amundsen-Scott South Pole Station in Antarctica. There are 5 different events taking place in Japan, a big celebration in Cologne, Germany, and over 30 events in the United States including events under 2 of the 3 flown space shuttles in California and Florida and an event at the Smithsonian Museum on the National Mall in Washington D.C. 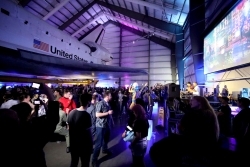 While many choose to celebrate Yuri’s Night by gathering with neighbors to stargaze and maybe spot the space station flying overhead, larger events feature government representatives and accomplished celebrities like NASA veteran Story Musgrave and science communicator Bill Nye (in Los Angeles) or private astronaut Richard Garriott (in Cocoa Beach). Many of these events will be celebrating the 50th Anniversary of NASA’s Apollo 11 moon landing like the Smithsonian National Air & Space Museum event, which is part of the museum’s “Apollo 50” celebrations this year. With at least one or two events this week in most countries around the world, it is likely that no matter where any person lives, they can make it to a celebration of space near them. That’s the goal of Yuri’s Night - to touch every human on Earth and show what amazing feats of human achievement can be reached if we work together towards the common goal of exploring our universe. To learn more about Yuri's Night events worldwide and how to find events being held nearby, check out the Yuri’s Night Worldwide Event List at http://yurisnight.net.